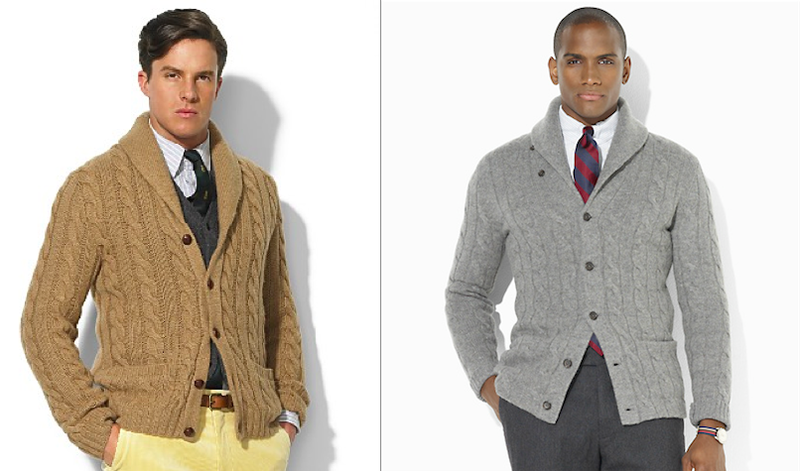 If you don’t own a shawl-collar cardigan, it’s the one sweater you should invest in this winter. No other knitwear is more versatile: its collar makes it the only style that works with T-shirts, shirts or polos, for everyone. Some men (such as me) don’t suit T-shirts with crew- or V-neck sweaters, as they leave the neck too bare. 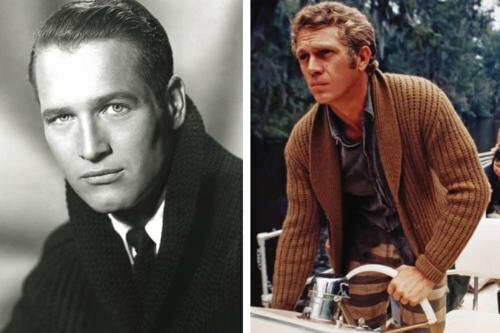 A sweater with a collar of its own (usually called a polo collar, like the Dartmoor) solves that problem, but rarely works with shirts – the double collar is too much. Which leaves you with the easy, effortless elegance of the shawl collar. The Drake’s four-ply cashmere model is my default attire during the winter when I get back from work: in flannel grey, with jeans (now Levi’s bespoke) and my beloved gomminos. That heavyweight style is effectively a substitute for a jacket, and works to that effect on a casual day in the office. It’s cut big in the waist, as much traditional Scottish knitwear is, which makes it advisable to buy in a slightly smaller size, and means it works well worn undone. Indeed, thinking back to reader questions about casual but stylish combinations for work, you could say it is the winter equivalent of the Finagon. The fold-back cuff on the Drake’s model helps in this regard: it can be adjusted so the sleeve is not too short. I also recommend the range at J Crew, which comes in wool, lambswool and cashmere, and therefore a range of prices. Most lack the fold-back cuff, but they are slimmer fits. Anderson & Sheppard’s haberdashery also does lambswool versions that are both slimmer and shorter, which enables them to be worn under jackets. Such lightweight styles demonstrate the versatility of the shawl yet further – as true true cardigan rather than jacket. You can follow the discussion on The eternal style of the shawl-collar cardigan by entering your email address in the box below. You will then receive an email every time a new comment is added. These will also contain a link to a page where you can stop the alerts, and remove all of your related data from the site. Do you know who makes those for Drake’s and Anderson & Sheppard’s haberdashery? I guess either Johnston’s or John Laing but not sure. I can check Nestor. Why, out of interest? Always curious about where the things are really made, especially after reading your articles about factory visits. Btw, last weekend I was in the Loewe shop in Barcelona and nobody working in the shop was able to answer questions regarding the location where the production was conducted, or wether the garmens were machine or handstitched. They though I was an industry spy, although they were very kind telling me about answering by email. The same suspicious attitude I have found elsewhere in my city. I can understand this given that is risky to have a shop with people trying garments and buying them cheaper via online. I understand in this that you say you have personally had good experience with JCrew, I feel I must, however, comment that I have not. I recently purchased two cashmere sweaters from JCrew (both the same model just two different colours). When they came in the mail one of them had tags, some spare yarn for patching holes, and several interior tags on the collar and by the waist. The other, however, had no tags, no spare yarn, and the interior tag by the neck looked like it had been hastily pulled off –leaving a very large hole by the neck (recall, no yarn to patch this one), and the tag at the waist had also been removed (with scissors, and one can see the cut marks). What I received was a very clearly returned sweater, which someone else had decided to remove the tags from and in the process ripped. I contacted JCrew by telephone and was told very clearly that they would not take it as a return, as it was a damaged item, and they had no proof I hadn’t been the one to damage it. I suppose thats what you get economising and buying something made in china, even though it was advertised as ‘italian cashmere’. I have had much, much, better experience with the American company Brooks Brothers, similar price point but seemingly higher quality, and the more expensive Ralph Lauren (he has different lines, I’m meaning from the higher end line that you can purchase at the store in London). I have also had decent experience with the budget company, WoolOvers here in the UK. Thanks C. One problem with J Crew is it’s about 50% more expensive in the UK than US. Those other brands are higher end. Still no excuse for poor customer service though. Without a doubt my favourite type of winter knitwear. There is something about its loose resemblance to a jacket which gives it a rakish smartness. I’ve always gotten complements on them and have always thought more men should wear them. I own a few but my best is probably from Charles Tyrwhitt, which I highly recommend for those on a budget. Heavy wool and a fairly slim cut; I think I paid £60 for mine. Looks great with an Oxford button-down, jeans and suede boots. I’m looking forward to getting mine out this winter. Where are those two other photographs? I wanted to ask if the model on the left is wearing yellow trousers? Just a word of caution to those who are intent on purchasing a heavy weight garment. Two years ago i purhased from Berk a camel hair shawl cardigan to wear indoors and have worn it twice i believe. It is far too warm for house wear and for me, not suitable for external wear. Furthermore, for those who are smaller in height like me these can make one look very bulky in all the wrong places! BTW – have just received my John Smedly sleeveless jumper. Very nice it is too – very lightweight, a lovely green, short in the fit and ideal for London where it is always warmer than elsewhere. Good work on your behalf. In your last post, commenters made mention about how ‘modern fit’ will be out of date in the coming years. If we define modern fit as, for the most part, ‘slim fit’ or as L. Rubinacci might say, ‘like a second skin’, then I disagree that this look will soon be dated. Last night I revisted Flusser’s ‘Dressing the Man’, and he uses many photos from the 1920s, all featuring men in clothes that were pretty fitted. If you have a DB blazer or similar with a bit of room, do you think it’s acceptable to wear a shawl collar cardigan underneath it? Thanks. Slightly different question, but related I think – do you think October is too early for Fair Isle patterns? I am looking for a “slimmer fit” shawl cardigan. Any experience with the ROBERT OLD BALMOUR SHAWL COLLAR CARDIGAN? Or is there a better reccomendation? I would like to know if penny loafers with a rubber sole are appropriate to wear in this supposed outfit: an odd navy sportcoat, grey cardigan, blue shirt ,very casual knit tie and khaki chinos. It’s a small thing, so it should be fine. But it’s largely dependent on how dressy all those other things are. I’m Impressed by Anderson and Sheppard’s shawl collar. Blue or Grey though, that’s the question? Hi Simon who makes Drakes knitwear? Simon, during the winter I purchased a shawl cardigan from Smedley called the Sherwood and it’s fantastic. The blend is 90% merino wool/10% cashmere and feels very soft and is beautifully made. I wore it with Sunspel t shirts and it was a fabulous look. The sweater is very reasonably priced given the superb quality level. Smedley actually makes several Fall/Winter collared models. A piece on Smedley cardigans would be useful. Didn’t bother reading all the other comments – so maybe its already here. But the sweater on the first picture from James Bond is a brilliant cardigan from Tom Ford. It was a brilliant cardigan in a beautiful italian cut. Finally getting around to buying a good quality shawl cardigan. I am looking at getting the one you have from drakes but from another brand – Thom Sweeney who offer the same model made by Lockie but with horn buttons instead of leather. Have you found it stretches a lot based on the soft cashmere and the ribbed nature? I don’t want to buy a perfect size out of the box and end up with a baggy sack after a few wears. If it’s the same yarn and knit as the Drakes one, then no it doesn’t ‘grow’ over time. I have been meaning to give them a try. I purchased a Ralph Lauren polo one in cashmere. Lovely design but awful low quality cashmere and was falling out of shape just trying it on. Had to go back not what you expect for a £500 garment. Simon, how do you store your cashmere shawl collar cardigan when you’re not wearing it? 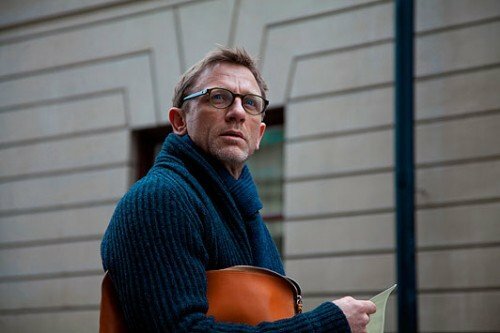 Simon, I need to decide whether to get the Drake’s cashmere or lambswool version. I am on a budget. I can either get the cashmere and don’t get any more knitwear for the season, or get the lambswool and some other pieces (such as a lambswool roll neck and a sleeveless cardigan). What would you recommend? Thanks!